Gurudwara Majnu Ka Tila Sahib is located Opposite Timarpur Colony, Delhi.The Opposite Gurudwara is dedicated to Sikh Guru Nanak Ji.The Gurudwara Majnu Ka Tila was visited by the founder of Sikhism and the first Sikh Guru named Guru Nanak who was renowned for his secular teachings and divine qualities. Guru Nanak sanctified this place during the 15th Century AD when he was travelling across India preaching the good news and love of God. This Gurudwara stands on a white marble & a majestic top and since it is situated on the banks of the river, the view of River Yamuna is outstandingly beautiful and serene – a good shot for all photographers, especially during sunrise & sunset. Carrying people across the river in his boat for free, prayer and meditation were the sole aims in his life. He craved for a Darshan of God so much that the local people started calling him "Majnu", after the Persian lover. One fine day, he had the chance of meeting Guru Nanak, who blessed him and helped him achieve enlightenment. Thereafter, he became a staunch devotee of Guru Nanak. It was his hermitage on the banks of the river Yamuna that later came to be known as Majnu-Ka-Tila. The site of Majnu Ka Teela Gurudwara, in New Delhi, has seen many spiritual discourses between yogis, sufis, fakirs and Guru Nanak. Guru Har Gobind, the Sixth Guru also stayed at the Majnu Ka Tila, when Emperor Jehangir invited him. 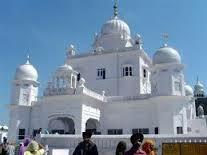 Slowly and gradually, this place acquired significance and a gurdwara was constructed here. 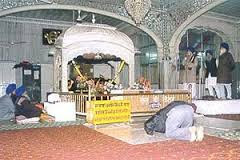 The Gurdwara also houses a well inside its compound. Every year, the birth anniversary of Khalsa is celebrated at the Gurdwara on Baisakhi with much fanfare and a "langar" is arranged for all. 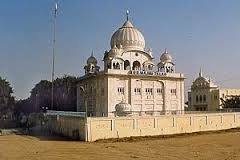 The Gurdwara Majnu Ka Tila is a small complex made of white marble and homes a small sacred pond. It also welcomes devotees from across the country to celebrate the Birth Anniversary of 'Khalsa' which refers to the assembly of all the Sikhs who have been baptized in the Holy Communion Ceremony or 'Amrit Sanchar Ceremony'. The name 'Khalsa' was derived from Arabic word 'Khalis' which means 'Pure' and was a Saint Soldiers' Military Order established by the tenth Sikh Guru named Guru Gobind Singh on 30th March 1699. 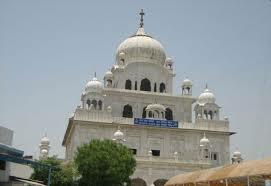 The Sikh Festival of Baisakhi is celebrated every year with great pomp and enthusiasm wherein the Gurudwara is lit up with bright lights and special prayer service is conducted followed by one of its kind event of providing people with free food called 'Langar' which invites both rich and poor people irrespective of their religion, caste or creed who sit together within the Langar Hall of this Gurudwara and join in this celebration. The historic name of area, literally means the hillock of Majnu,Gurudwara Shri Maznu Ka Tilla Sahib after the tilla or mound where during the reign of Sikandar Lodhi on Delhi Sultanate, a local Iranian Sufi mystic, Abdulla nicknamed Majnu (crazy), met Sikh Guru, Guru Nanak on July 20, 1505. Majnu ferried people across the Yamuna river for free as a service to God, his devotion resulted in the Nanak staying here till end July. 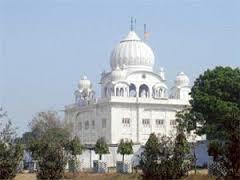 In later history Sikh military leader Baghel Singh built the Majnu ka Tila Gurudwara to commemorate the stay in 1783, and the sixth Sikh guru, Guru Har Gobind also stayed here. Today it is one of oldest extant Sikh shrines in Delhi and the surrounding estate of donated by early 19th-century Sikh emperor, Ranjit Singh. Majnu Ka Tilla area has three main residential settlements with total 3000-3500 homes, Aruna Nagar, New Aruna Nagar and Old Chandrawal village, which was came up in early 1900s, when British government settled labourers involved in the construction of the Central Secretariat buildings, during the construction of the New Delhi. The next round of settlement came post-independence in 1958-59, when Aruna Nagar was developed by the Land and Development wing of the Urban Development ministry as it disburses 925 plots of 40 sq. yard each, to people resettled here from various part of North Delhi. The Tibetan refugee camp later named New Aruna Nagar developed after 1960, and more recently two large jhuggi jhopari (hutment) clusters have developed on the periphery. By Road : There are many public and private vehecals available to reach Gurudwara Majnu Ka Tila Sahib Delhi.There are many taxies and city buses available. By Metro : The Nearest Metro station is Vidhan Sabha Metro station. By Rail: The Nearest Railway station is Hazaerat Nizamuddin Station Delhi. By Air : The Nearest Airport is Indira Gandhi International airport Delhi. This is amazing and interesting blog post. Truly beautiful photos. Your pictures tell a wonderful story. I really like this wonderful post.